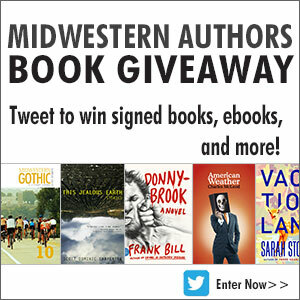 We’re thrilled to announce our first ever Midwestern Authors Book Giveaway, where you can win signed copies and eBooks from some of the best talent the Midwest has to offer. And the best part is, all you need is a Twitter account to enter. TO ENTER: Retweet the contest tweet from @mwgothic. That’s it! For each prize we’ll draw a winner (at random using Random.org) from the collected pools of entries (read: each retweet is an entry). PRIZES: We’re giving away a slew of daily prizes, with bigger prizes at the end of the week. 1st Prize: 1 Yearly Digital Subscription to Midwestern Gothic (4 issues), 1 Midwestern Gothic: Summer 2013 – Issue 10 paperback, and 1 This Jealous Earth eBook. 2nd Prize: All 10 issues in the Midwestern Gothic catalog in eBook format as well as a This Jealous Earth eBook. Not only does re-Tweeting the contest tweet put you in the running to win one of these prize packs, but it also enters you automatically into the drawing for a daily prize. You get one entry per day—that means if you RT the contest tweet every day of the contest, you have a shot at winning all the daily prizes, and you get 5 chances to win the prizes at the end of the week. Daily winners will be announced on Twitter, and only RTs from that day will count toward that day’s prize. If you enter and win a daily prize, you can still enter, once per day, for the rest of the contest duration for a better shot at the final prize. You can only win one daily prize per twitter account. Being an ex-Midwesterner living in San Francisco, I enjoy very much all you do. And I’ve tweeted the contest. Well done!